Byron Bay is the place for out-there and indulgent experiences, but how to tell the chic from the backpacker? Cut through the hype and get straight into authentic Byron this Christmas holidays. 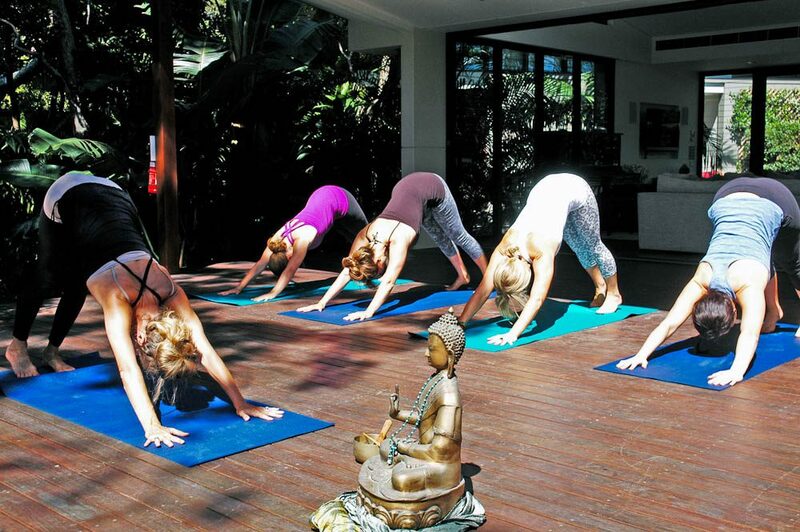 Combine surfing, yoga, a cooking workshop and massages in one place at Escape Haven Retreats (1). The seven-day retreats are designed for eight women at a time (from 25 to 55). As far as spas go, The Byron at Byron (2) is a decadent option and Mullum Sari, a boutique day spa at nearby Mullumbimby (3), is also somewhere to consider on your wellness quest – complete with infrared sauna in a stunning Buddhist garden. For a swim (4), Cosy Corner, at the lighthouse end of Tallow Beach, is where the locals go when it’s a windy day because it’s the most protected around. Or go to the Tea Tree Lakes – locals will give you directions. Whites Beach took top spot in our 100 incredible travel secrets of Australia, even though it’s just down the road from million-dollar Main Beach. You need to drive down a dirt road through rainforest, stop at an unmarked spot, and wander down a quiet, tree-lined path onto the white shoreline – it feels a world away. Nearby Bangalow (5) is what you get when you take a small country town, add some big city flavour and let it marinate for a few decades. Not too far away, Liliana’s is a homestead in the middle of nowhere – it’s a lovely farm setting and the food is amazing. They do clever, substantial meals. Newrybar (6) is a great outing – it’s a tiny little town with a bric-a-brac shop. The Harvest Café there is run by a young couple who are really passionate about what they do. Ask about their themed nights. All beached out? Following the Byron-esque themes of “inspiration, creativity and involvement in the visual arts”, the Byron Arts Classic (7) is a hub for artists from all disciplines across the area (January 11-16). Starlight Wellbeing Expo (8) in Bangalow (January 9-12) will surely look after your inner-health hankerings, showcasing the health and wellbeing experiences available in the shire. Films buffs have a couple of options: Flickerfest Short Film Festival (9) lands in Bangalow (January 25-27). Or for those looking for a last-minute lucky dip, you can catch a show, dance or travelling flick in one of the Byron Shire community halls (keep an eye out on the local papers/noticeboards for details). The Rails Pub for some complete local action. Bands play there every night and the food from that tiny kitchen is some of the best you’ll ever eat – especially the Bangalow pork. Or try Targa in the main part of town. Other quality alternatives in Byron’s ocean of choice are One One One, The Roadhouse and Miss Margherita. For more information, see Visit Byron.